EG Media Tech is the first event of its kind in the region to be dedicated to the entertainment and media technology sectors at an international level. The free-to-attend exhibition and seminar sessions offer the opportunity for key players in the industry to meet and debate the various challenges facing the industry and source the latest equipment and services available to the market. EG Media Tech is pleased to announce that they have the official support of Egyptian Media Production City, the largest media and production entity in the Arab world. And have secured several important Foundation Partners including; La Familia, a London based video production agency, HiLights Media Production, one of the leading turnkey creativity and innovation companies in the MENA region, CineSpot, specialists in lighting, cinema, camera, broadcasting and studio equipment and Systems Design who provide solutions and consultancy services for the broadcast industry as well as AV solutions. Alongside the exhibition will be seminars featuring key speakers from the industry and celebrities hosting debates and presentations on the latest trends in the market and technological developments. 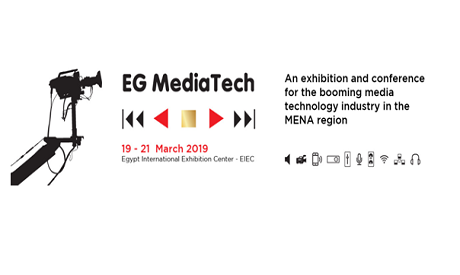 Visitors to EG Media Tech will include high-level representatives from Egyptian state and privately owned TV companies, online and satellite channels, radio, the National Media Authority, consultants, many country embassies and anyone involved in the media technology industry. For more information please visit the website – www.egmediatech.com. 19 – 21 March 2019, Cairo, Egypt. EG Media Tech is organized by BME Events. Our aim is to deliver exceptional events and we pride ourselves on our flexibility, agility and attention to detail when it comes to our clients’ needs. Over the last 10 years we have organised events for heads of state, ministers and global business community all over the globe. Our experience in delivering a broad range of event formats, including B2B, B2C, product launches and large scale exhibitions and trade shows, means that we can custom build your event from the ground up, no matter the size.